If you are wondering which district you should stay in when in Venice, you might be curious to know the reasons why choosing Cannaregio would be a comfortable choice. Cannaregio is the first district you walk in once you step out the train. Cannaregio is the back of that fish called Venice. Despite the fact that Hotel Arcadia is located in this district, here are the reasons why Cannaregio is the perfect place to stay. Cannaregio is a off-the-beaten-path place, where you can walk and silently admire beautiful little glimpses. Getting lost here is a pleasure, it seems to be projected in a painting of Canaletto. This is the perfect place where to escape from the crowd and enjoy some peace. The first European ghetto is located here, in an area of Cannaregio. It takes only a 5-minute walk from our hotel. You can spend an entire day here, if you have time, and discover the fascinating Jewish culture and religion. Don’t miss the chance to have a biscuit or some sweet from one of the many Jewish bakeries around. 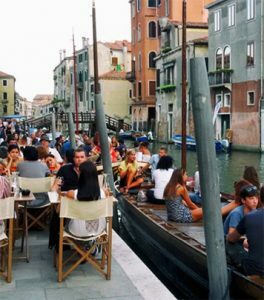 Even if we said that Cannaregio is a quiet district, there’s a fondamenta, in particular, where people love to have happy hour. This fondamenta, we have already mentioned when we wrote about a bacaro tour idea, is full of typical Venetians bars, where you can taste the traditional cicheti and order a ombra (small glass of wine, usually sold for 1 or 2 euros). When the sun is going down, the aim of this site changes and from a quiet place with almost nobody around, it turns into a funny and comfortable aggregation point. Here’s where locals meet after work, before going home. Since Cannaregio is away from the most touristic beaten paths, it’s also the place where lots of Venetians live. You won’t be surrounded by restaurants, masks stands and souvenir shops but you’ll be the neighbour of a Venetian. Among Venetian narrow streets the inhabitants’ real life comes out, revealing its true nature. We have already talked about the presence of the oldest Jewish Ghetto in Europe, but in Cannaregio there are also the Ca’ d’Oro palace, the famous Venice Casino and the beautiful church Madonna dell’Orto. Next to the Ca’ d’Oro palace there a so-called stazio, from where you can reach Rialto’s Market with a 2-minute gondola ride. As you can see Cannaregio is plenty of things to do and see. Now that you know the reasons why you should choose Cannaregio for you stay, are you still doubting where to stay?